Saturate Audio | Saturate Audio Immersed II. Basil O’Glue who has numerous releases on top labels like Pure Trance, JOOF, Black Hole recordings and Styller with releases on the seminal label Coldharbour recordings, Armada & Perfecto are the co-founders of the worldwide known record label Saturate Audio which manage to establish itself with numerous beatport trance top 100 releases and support from DJs like Armin van Buuren, Above & Beyond, Markus Schulz, Solarstone to name just a few. 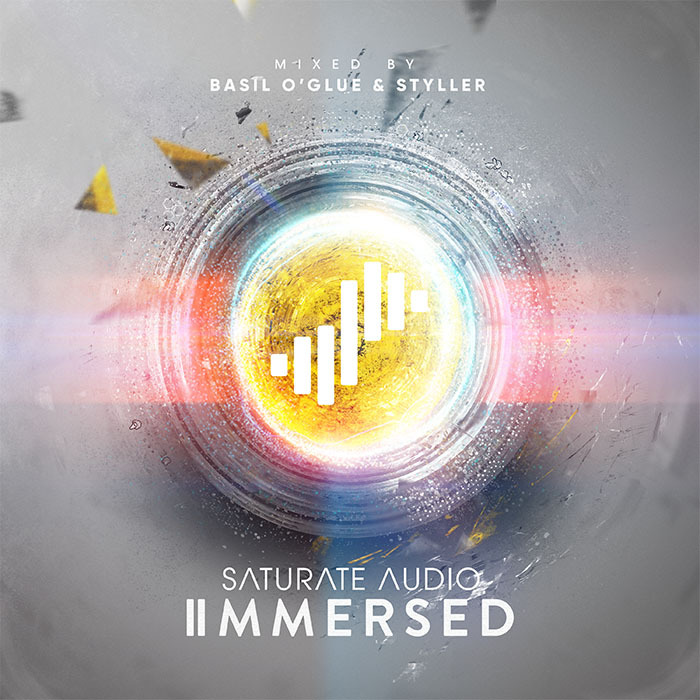 In 2014 Saturate Audio owners have curated the impressive 2-CD compilation Immersed. It was definitely one of the most influential compilations for the fanatics of deep dark progressive scene as it included artists that now are at the forefront of the movement. 24 of September is the date that the long awaited second episode of Immersed will be finally released. Two CD’s as always and two fantastic immersive deep melodic music journeys that combine the talents of some of the most prolific producers of the genre like Forerunners, Danilo Ercole, Philthy Chit with his last ever track under this pseudonym, Rafael Osmo, Moonwalkers, Phase Difference, Arcalis and upcoming talents that we should keep an ear on like Hexlogic, Evgeny Lebedev, Sam Davies, Serge Landar and many more. 28 magnificent explorations of the unlimited endless boundaries of deep progressive with influences ranging from house to trance, techno and electronica. The label owners deliver as you could expect exclusive cuts. Styller with his solo ‘Prisma’ and ‘Burning Lane’ in collaboration with Matthew Peterson while Basil O’Glue teams up with Gordey Tsukanov for the ‘The Day Before’ and his solo ‘Who Is This’. As you can sense Immersed II. is one of those compilations that in some years will be considered as classic for the deep progressive scene so it is highly recommended to accept the invitation from Basil O’Glue and Styller and let yourself to be totally and utterly immersed to the impressive sounds and innovative tracks that break boundaries and push forward the deep progressive sound that grows rapidly all over the world as the fanbase expands and new producers pop up all over the globe. This compilation definitely raises the bar that similar compilations will be compared with. Immersed II. can be used as your perfect introduction to Saturate Audio’s legacy in the or can extent your addiction and dependency to this over reliable label for your supply of deep progressive that can be melodic, technical, lyrical, romantic, futuristic, distant, mysterious, enlightening, spiritual, artistic, elegant, intellectual, eclectic, emotional, cold or distant but most importantly fun and enjoyment to immerse yourself with. Take the challenge, let yourself be surprised and simply Enjoy this trip! electronic music journalist &rResearcher and radio host at 1mix radio.